Thirty years of “crisis,” mass unemployment, and flagging growth, and they still want us to believe in the economy. . . . We have to see that the economy is itself the crisis. It’s not that there’s not enough work, it’s that there is too much of it. 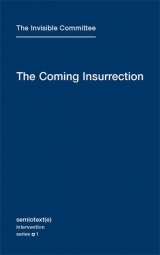 Hot-wired to the movement of ’77 in Italy, its preferred historical reference point, The Coming Insurrection formulates an ethics that takes as its starting point theft, sabotage, the refusal to work, and the elaboration of collective, self-organized forms-of-life. It is a philosophical statement that addresses the growing number of those—in France, in the United States, and elsewhere—who refuse the idea that theory, politics, and life are separate realms.